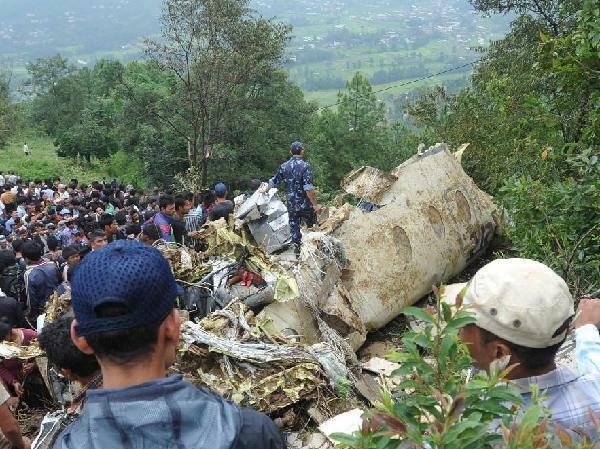 An airplane of Nepal's Buddha Air crashed at Kotdanda of Lalitpur Sunday morning, leaving all the 19 passengers on board dead, local police said. Those killed in the crash include 10 Indians, one Japanese, two Americans, three Nepalis along with three Nepali crew members, the source of Buddha Air confirmed. All the victims have been identified. One Buddha Air's twin otter plane, which lost its communication at 7:30 a.m. Sunday morning with the Tribhuvan International Airport (TIA), crashed in Lamatar Kotdanda village of Lalitpur while returning from mountain flight. The cause of the crash is believed to be adverse weather conditions. According to an official from the Meteorological Forecasting Division, the visibility at the crash site was very low because of heavy fog and rain. Rescuers found a 36-year-old Nepali passenger alive but he died later in hospital despite doctors' efforts. All the bodies of the 18 victims at the site have been taken to TIA.